A minister friend told me the other day that he was puzzled as to why although humankind has made tremendous progress in terms of knowledge and ability to sustain and support population, and yet although there have been vast improvements and safety with transport and much improved understanding in what makes us tick – there has been almost zero corresponding improvement in morality. Our wars are more violent and kill a greater percentage of civilians, he said, wealthy nations will callously exploit vulnerable nations for resources and only intervene for peace if there is a clear advantage in self interest. Financial fraud is virtually out of control and whole nations as well as local economies have been threatened in the process. The number of refugees is horrendously high and the gap between rich and poor mounts daily. His analysis is probably fair comment. Towards the end of World War 2 the fire storms over the cities of Coventry, Dresden and Tokyo certain showed what total war might mean and we can take small comfort that at least thus far there haven’t been more nuclear weapons used since Hiroshima and Nagasaki – but as Christians we should feel very uncomfortable that whereas wars in previous centuries typically had of the order of 10% civilian casualty and 90% military casualty, yet for many of the modern wars our nation has supported, those percentages are now approximately reversed and it has been the civilian component of the local population who have suffered the most. Although the weapon development has made it urgently imperative to find new ways of making peace there is little sign that many appreciate that such a change in thinking is on the horizon. In the US in particular history conspires to add to the problems. Dating back to the American war against Britain and the need to mobilise a militia when the community is threatened, the right to bear arms is now seen as an essential part of their Constitution. As weapons have become steadily more lethal and the accessibility has increased, the problem they now have is that weapons can be and are purchased not only to protect a community – but in the hands of the antisocial, actually become the means to threaten the community. In the US, total gun crime may have come down a little from the appallingly figure of a few years ago, but incidents of mass shootings have remained at unacceptably high levels, and far higher than most civilised countries. We are in no position to advise the US on their gun laws, but we must also decide for ourselves which direction our gun laws should be heading if we are to have a safe community. “Turn the other cheek” he taught. “Keep no score of wrongs……” Where does that sit in our foreign policy? “ You have heard that it was said, an eye for an eye, a tooth for a tooth, but I say don’t use violence to resist evil”. (Matthew 5: 38-39) “Love your neighbour as yourself” he explained that one with the story of the good Samaritan, which in view of the religious differences between the Jews and the Samaritans seems remarkably contemporary as a pointer to best action in Middle East politics. Then he entered Jerusalem on a donkey to underline his commitment to peace. To be truthful only a small minority of Christians have maintained Jesus’ uncompromising insistence on rejecting violence. Even St Paul acknowledged the practical difficulty of achieving total pacifism and instead in chapter 12 of his letter to the Romans came out with: “If it is possible, as far as you can, live at peace with all men” We seem to have drifted further than Paul from Jesus’ determination to insist violence must never be the best answer. Are you aware for example that for something like 300 years the early Church did take this message seriously. For example they adopted non violent methods of resistance, and what is more their list of who should not be baptised included soldiers along with gladiators, idol- worshippers, brothel keepers, and magistrates who exercised the power of the sword. Unfortunately for Jesus’ message, once the Roman Empire adopted Christianity as its approved state religion, the arming of Christians in defence of the empire became standard practice – and although the uneasy relationship between State and Church eventually led to such distortions of Jesus’ teaching as the crusades, some of the orthodox Churches reinstated the insistence that soldiers could not be baptised and continue to fight. You may remember that years later Ivan the Terrible compromised on this and insisted that since his personal guard should be baptised, their sword arms should be held high during the ceremony and not immersed so that the un-baptised part of their bodies could still be used in his defence. In an imperfect world it is also clear that historically some conflicts have been avoided by the efforts of peacekeeping forces. Christians are by no means agreed about whether or not a just war can be fought and it would be a great pity to legislate against those who are genuinely following their conscience. Unless our own consciences are clear that we have genuinely done everything possible to avoid conflict there would be a moral problem if we were to insist we had the right to tell others who were going to join up – what they must or must not do. Perhaps it is not too late to return to Jesus’ advice about peacemaking and see for ourselves if the one we claim to follow might have had it right all along. This entry was posted in Sermons and tagged Enola Gay, gun laws, Hiroshima Day, lizard brain, Peace Sunday. Bookmark the permalink. In the past with famous leaders, such as Alexander the Great, or Frederick the Great, or Napoleon, the general or leader in charge was in the thick of the battle, right with the troops. Military campaigns were about beating the other troops. Now (at least the last 120 years) countries have large populations, governments have huge bureaucracies, armies are huge numbers and the leaders are quite remote from the battle so those leaders just consider the troops as numbers to be moved about to meet objectives. To motivate the troops and to prevent rebellion at home, the opposition must be demonized, or not treated as human beings. With that approach, the leaders group everyone as the evil enemy, armies or insurgents or civilians, to be demonized together and to be killed whether fighting or not. America dropped the atomic bombs on Japan to demonstrate the new technology, to intimidate the Russians, and to continue the death and destruction from the air. 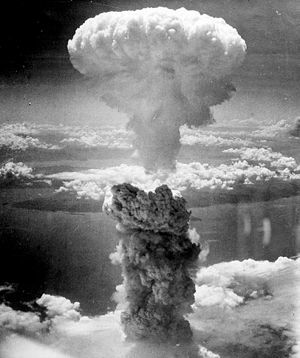 If the atomic bombs were truly intended just to end the war then Americans would not have continued fire bombing Japanese cities even through August 14, more than a week later. Contemporary political and military leaders no longer have any empathy for those affected by their policies because they are far removed from those people. They are never part of the killing process, never a first hand witness to the consequences of their directives, and never accountable for those results. I agree with you on all points. Although I dont know the original source a recent BBC documentary claimed the Emperor of Japan had signed a document allowing the Japanese to surrender before Hiroshima. These two articles make the same claim: two major newspapers, in Chicago and Washington, revealed on August 19, 1945 that Japan had begun asking about surrender terms back in early February 1945, and the terms Japan would consider in January turned out to be those agreed to in August. Thanks for the links. So much for the standard line that the atom bombs shortened the war. Assuming the articles are accurate I guess this leaves us with a war crime of monumental proportions! EVERY murder is a tragedy for someone. For too many here in America, that no longer seems to be recognized.